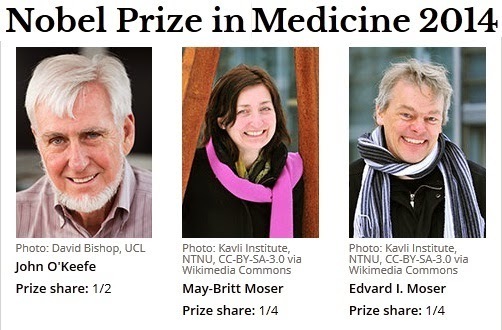 British-American researcher John O'Keefe with a Norwegian couple, Edvard and May-Britt Moser awarded this year’s Nobel Prize in Medicine for discovering “an inner GPS, in the brain,” that makes navigation possible for virtually all creatures. They earned the coveted prize for discovering a positioning system -- an "inner GPS" -which enables us to orient ourselves in space, the jury said. The research has implications for Alzheimer's and other diseases of the brain, it said. "The discoveries of John O'Keefe, May-Britt Moser and Edvard Moser have solved a problem that has occupied philosophers and scientists for centuries," it said. "How does the brain create a map of the space surrounding us and how can we navigate our way through a complex environment?" In 1971, O'Keefe discovered the first component of the system, finding that in lab rats, specific cells in the hippocampus were triggered when the animal was at a certain location in a room". Other nerve cells were activated when the rat was at other places, leading O'Keefe to conclude that these "place cells" formed a map of the room. More than three decades later, in 2005, May-Britt and Edvard Moser discovered another piece of the invisible positioning system. They identified "grid cells" - nerve cells which generate a coordinated system, rather like longitude and latitude, and allow the brain to make precise positioning and pathfinding. Research into grid cells may give insights into how memories are created -- and explain why when we recall events, we so often have to picture the location in our minds. The jury pointed out that sufferers of Alzheimer's disease often lose their way and cannot recognise the environment.